Microwave Heating Pads are Amazing if you are Always Cold! Have you moved to a cold climate? Growing up in South Texas where it is always warm, I quickly realized that I needed something to help during the cold winter months after I moved to Oklahoma. We get many days that are in the 30's or below and these just freeze me to the bone. I am always cold! I know it sounds unbelievable, but the cold actually hurts! My husband is from up north and he loves these cold days, so finding a balance with the thermostat can sometimes be a challenge. That is where my Cornbag Warmer comes in..... it has been a lifesaver because it gets used every day from the start of cold season until the end. It goes in the microwave first thing every morning to help with cold hands and it's used every night to help warm up the cold bed! Truly, I cannot imagine surviving fall and winter months without it. Thank you for making these amazing products - they have changed my life!! Are your hands or feet always cold? If you need to warm up your hands or feet because they are always cold, we can definitely help!! Our Pillow size is ideal for warming cold hands and is the perfect size to keep several lying around the house. The Lap size is ideal for both hands and feet and is our most popular size! Tired of crawling into a cold bed? Finally, if you are tired of hopping into a cold bed, because Cornbag Warmers make the perfect Bed Buddy Microwavable Bed Warmer! Are you going through cancer treatment? If you or someone you love is battling cancer, we want you to know that our hearts are with you. 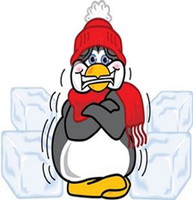 One of the side effects of cancer treatment and specifically chemotherapy is what it does to a person's body temperature - many report that they are always cold or they suffer through periods of intense cold. It may even be described as 'blocks of ice' being pressed against the skin. If you or a loved one is suffering from these symptoms, we may be able to help. We recommend our lap warmer because it retains heat longer than the other sizes and covers a larger area (it is 10x18 inches in size). Because we use corn, our warmers should feel very comfortable against your body because the corn flows across your skin. We want you to know that our hearts and prayers are with you if you are battling cancer, and we hope that our warmers are able to make your life a little easier during this difficult time. Electric heaters not allowed at work or in your dorm-room? Electric space heaters can start a fire so many companies and universities don't allow them. If you suffer from cold feet at work or college, then our Cornbag Warmers are perfect. Most people have access to a microwave oven, so our mircowave heating pads are ideal for work. Kids Playing in the Snow or Cold Weather? Our portable microwave corn heat packs are the perfect solution for when coming in from outside. Because they are portable and do not have to be plugged in, you can have several ready for the family when they come back inside for hot chocolate. You will find that the everyone will be fighting over your Cornbag Warmers when they come in from the cold - at least that's how it is at our house! !